You can not fail to see that content and links ARE the web! When it comes to pushing rankings with links and redirects, then redirects are NOT equal! 307 powered rankings... oh, my! If you have more questions or have made other experiences with redirects in the past, feel free to share your thoughts in the comments below! Redirects have been a hot topic in SEO for quite a while now and still many questions remain unanswered. Do redirects pass link juice? Do they pass penalties? Does it matter which redirect I use? These questions are essential to SEO, especially because things change over time and we may have missed something in our hectic business routine. We were fed up of not knowing, so we started doing our own research on redirects. 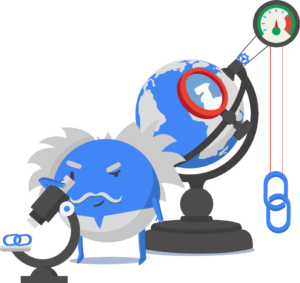 Alongside relevant content and RankBrain, links are Google’s #1 ranking factor, as Google already confirmed on various occasions. Google is a search engine, and therefore it needs links. 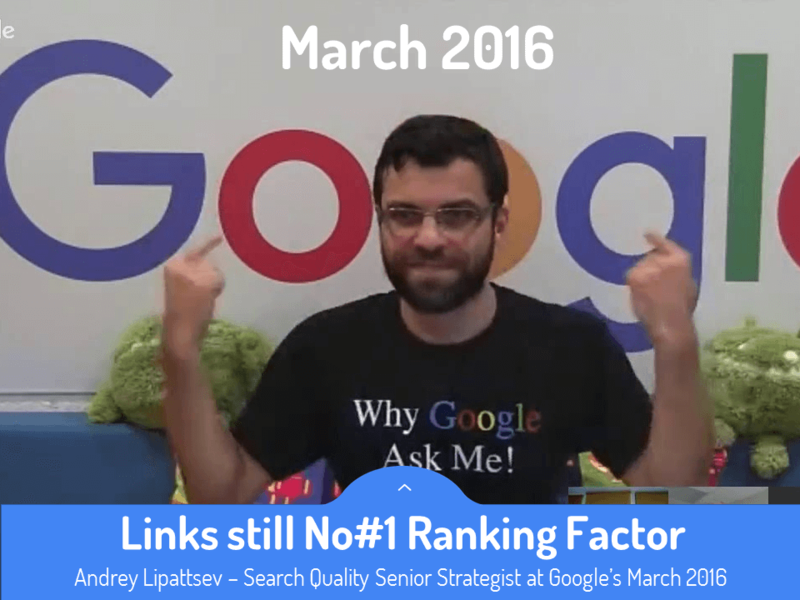 The fact that links are important was also confirmed by Andrey Lipattsev in March 2016: links and content are still the number one ranking factors for Google. We’re not talking about some PR guy here, but a technician. This is Google’s Search Quality Senior Strategist. Links are connected to great content. You cannot have great links if you don't have content that's worth linking to. For a website, getting links means getting traffic and rankings. 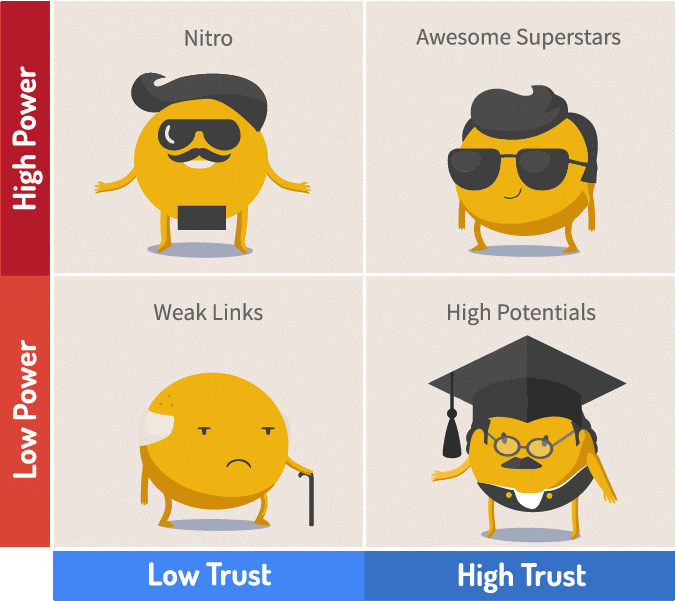 Poor content not only gets fewer links, but it also gets worse rankings. The web is full of mediocre content, and there are only ten organic results on the first page. If your content is not interesting, engaging, comprehensive, nice, shareable, easy to read, then you shouldn’t expect to have good results in SEO. You may or may not have seen TheSEMPost’s headline, saying that it would not matter which redirect you use, because all pass PageRank. SEOs have been arguing a lot when it comes to the different types of redirects. From that point of view, any redirect should have lost PageRank in the past, right? But wait! As our LRT Certified Xpert Derek Devlin discovered, 302 redirects DID harm this site in 2014. 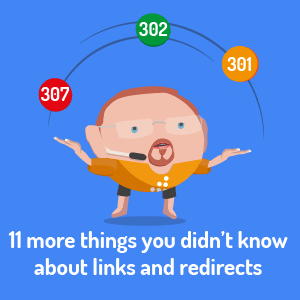 We placed links from pages that were powered ONLY by a 301, 302 or 307 redirect. The redirect’s target page was on an authority domain. Starting from the 2nd of March 2016, we measured the “anchor text passing power” of those outgoing links. Those are our results: on the x-axis, you can see the time that passed after placing the redirect. On the y-axis you see the page’s ranking on Google’s result page (1= first result; 2= second result; 0= no result). The blue curve is the source page powered by the redirect. The orange curve is the target domain. This means whenever you see the orange dots, the redirect works and passes the rankings over. Otherwise not. As you can see, between the 21st of March and the 18th of April, no rankings were passed at all. This is good so far. Now let’s check out how the 307 redirects behaved. As you can see, we have permanent fluctuations between the source page and target page for the first search result. So from these results you can probably tell, which redirect type is my favorite. Yes! The 302-redirect, as this one delivered the most consistent performance. Now let’s summarize what we have learned about the anchor text passing the power of these redirects. Maybe you have heard about the slow death of website rankings after a migration from HTTP to HTTPS, haven’t you? If you powered your migration via 301-redirects, your new domain is running the risk of slowly dying. In every case, it looked like the 301 and 307-redirects simply stopped working after some time. If this happens every time, this could have a dramatic effect on the whole web and for all SEO rankings. 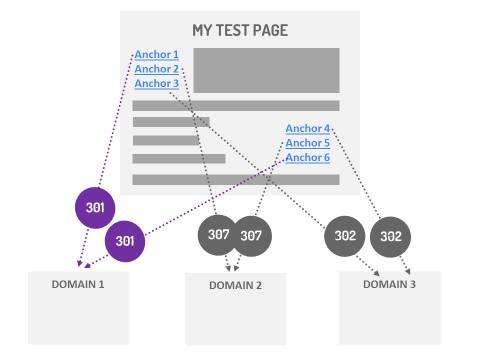 We also decided to measure the anchor text passing power via outbound redirects. For this, we set up a test page in 22nd of June 2016, with anchors linking out of the page via 301, 302 and 307-redirect. This scenario is quite often used when you are migrating from one domain to the other. Our targets were three top authority domains that were pushed by 2 outbound links each. Each of the target domains had two links going to it: first target domain via 301, second via 302, third via 307. 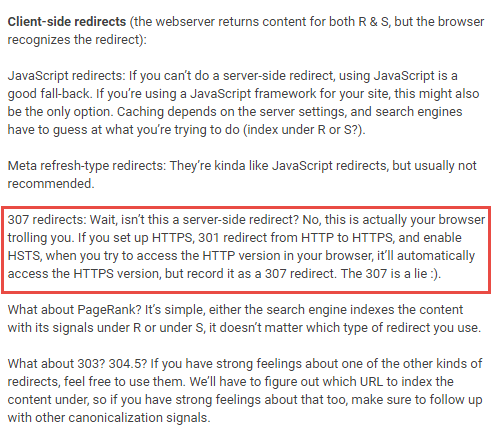 Now the first 301-redirect started passing anchor text already the next day, which is pretty impressive. But: it also stopped passing power four days later! The following weeks it went on and off a couple of times, but stayed off for most of the time. The second 301 did not work at all for the whole duration of the test. 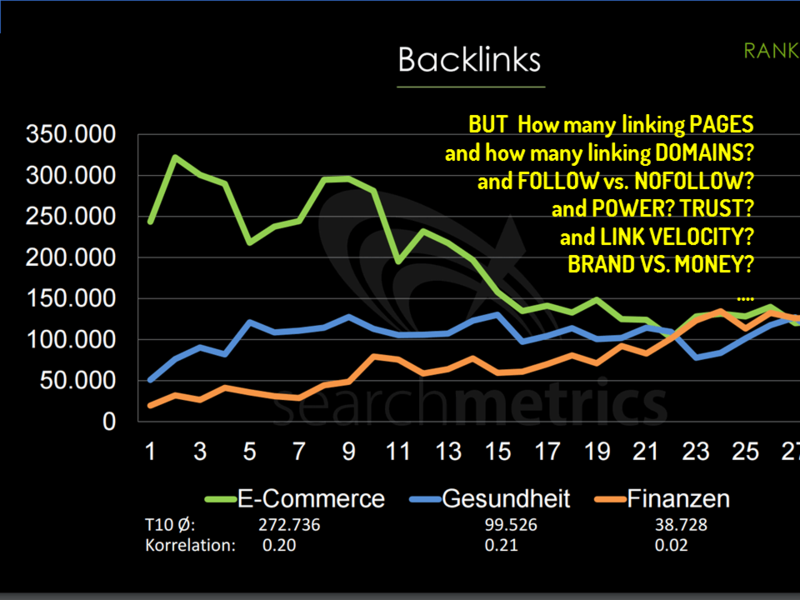 This somehow feeds the “only first link counts” idea, that has been going around the SEO industry for years. Here you can see the 301-redirect passing power, but also fluctuating. Whenever the curve is on #1, the site is ranking. Otherwise, the site is not ranking at all, which is dramatic! Link #1 kicked in the same day! Also, it did not go off during the whole testing period. Link #2 was also working the whole time. So during the whole time of observation, the target page was ranking first, and the source page was ranking second. Now this is what we call a WOW! The results for the 307-redirects were a little less satisfying. Link #1 needed a very long time to show some effect. Six and a half weeks to be exact. Unfortunately, it also stopped working six days later. Easy come, easy go, and link #2 did not show up in the rankings at all. This chart shows us that the target page was only ranking for six days during the whole period. So what should we think of that? While Google is all like “don’t worry, all redirects pass PageRank,” there is one thing they haven’t mentioned so far: NOT all redirects are equal! In fact, only the 302 is fast and helpful, the so-called temporary redirect. So it DOES matter which redirects you use unless all you want to do is to “pass PageRank.” We want to have long-term and stable rankings for our keywords, and this is why we do care about what redirects we should use. Redirects are the most core element of SEO. They are implemented with a couple of clicks and can help you (or harm you) big time. 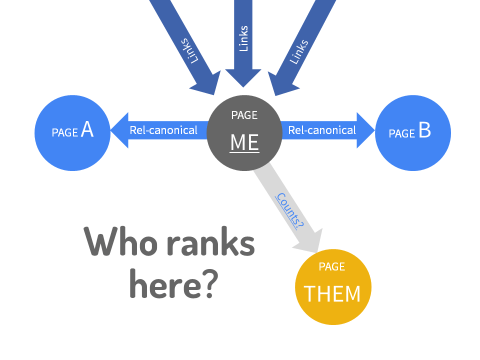 As a clever SEO, you should not be bothering about passing PageRank anymore. Google might still be using it in their explanations, but since they shut down the Toolbar, they now claim to have something they can measure and you can’t. All of the remaining scrips and link directories now claim to show PageRank, but all they do is to show either wrong data or technical error. What to use instead? Of course, we recommend the LRT Power*Trust Extension. 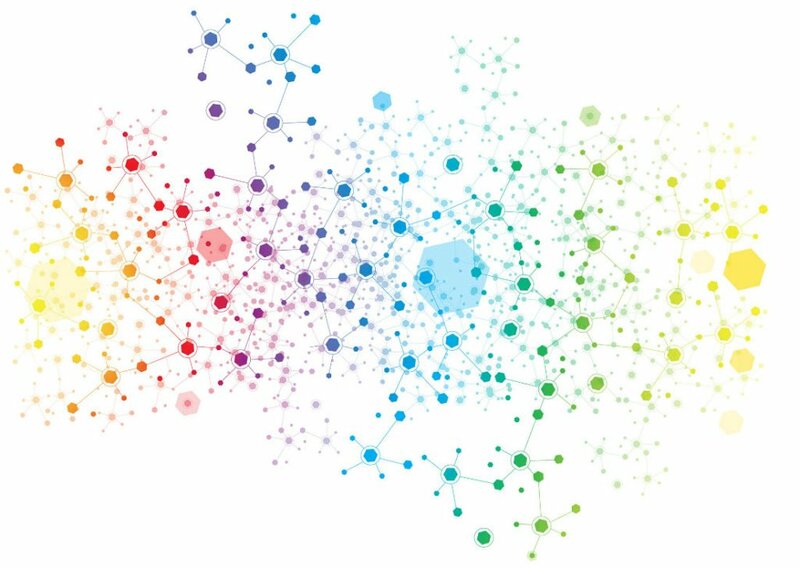 When you look at things in a two-dimensional system, you get much more than just a PageRank replacement. And by the way, it is available for free. You may also ask for specific link keywords and many more aspects for each link. Also consider that there are many different weights for each industry, country, language and keyword. There is no one-size-fits-all. For example, a single domain linking to you from 1.000 sub-pages is NOT like 1.000 domains linking to you from a single page each. This is why we implemented the site-wide filter in our tools. Remind yourself of the difference between linking pages and linking domains. Remind yourself of all the metrics there are to measure the quality of a link. The links you see in such charts may already be inactive for a long time. 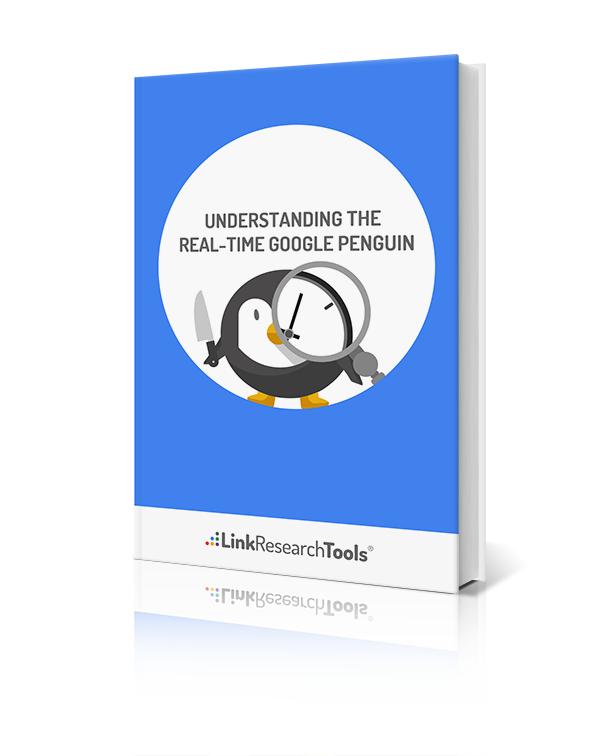 This is why we built the LinkResearchTools (LRT) in the first place. Back in the days, when LRT was still an internal tool, we crawled all the links for accurate statuses of backlinks. Today, we offer the Link Check Tool (LCT) for that. When John Mueller claims that your browser is trolling you, by that he means that Chrome is trolling you. Other browsers don’t have this bug, so it is the Google Chrome Team trolling you. But this sure does not mean that the 307 doesn’t exist. Why does John Mueller “forget” server side 307? I asked him and he didn’t even get what I want. @cemper What's your point? You can return 999 if you want too. With the Link Redirect Trace Extension, you can see that you can create a loop with a 303-redirect and a Rel-Canonical. This is putting the Google search algorithm in a tough situation: show both or show none? LinkedIn understood that loop and managed to rank with two results for the millions of pages listed by LinkedIn for a while. So again, in this case there were two results ranking in the SERP for the same term “Cemper” (my last name). The only difference in the content was the word “Austria” for the AT-related subdomain. The link from Page ME to Page THEM would usually count. If there is a Rel-Canonical placed to Page A, in the past, we always thought this worked like a redirect for bots. It now looks like that the link still counts – despite the fact we would all have excluded the link from all the data. We call this “Canonicaled Link” and those links were removed from the link graph in the past. However, Google kept reporting them so we came to the conclusion that we found a new “species of links” with this. 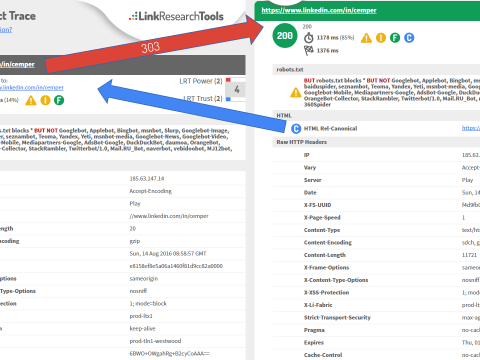 Very soon we’ll be showing all these links in LinkResearchTools (LRT) as well. 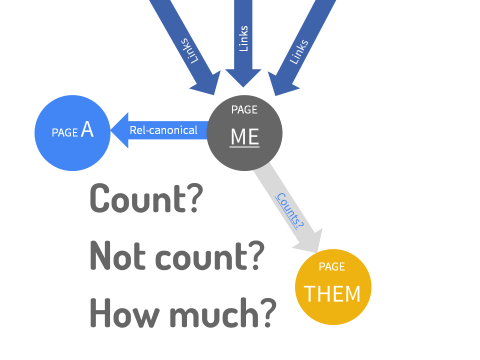 Let’s take the same model again, but this time, the Page ME has two Rel-Canonicals to the pages A and B. What happens to THEM? What happens to the other two pages? Is it valid to have 2, 3, 4, 5 Rel-Canonicals on a page? Yes it is by the HTML standard. But what does Google do about it? Where can you see those extra canonicals actually? 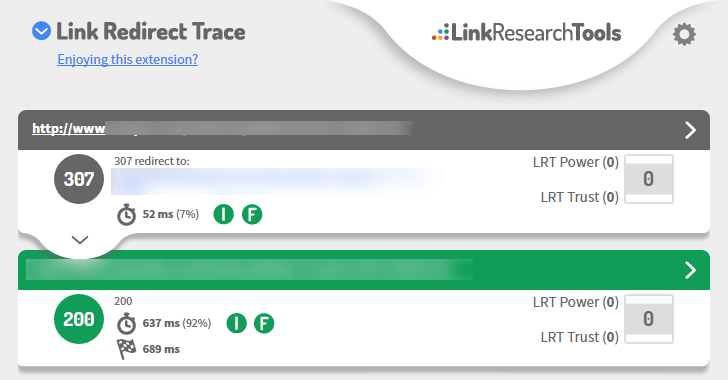 In LinkResearchTools (LRT) actually very soon. And of course the Link Redirect Trace extension already for some months. If you want to get updates on our SEO tests about redirects, just sign up to get all the newest information. 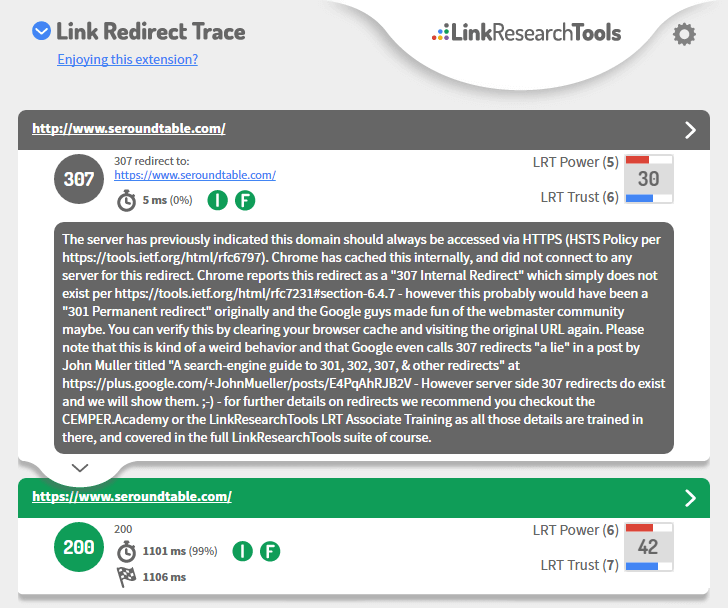 Or you could test it yourself with our free Link Redirect Trace Extension. Did you know that developing the Link Redirect Trace Extension was motivated only by the need to conduct such tests and get accurate data for special cases as described? 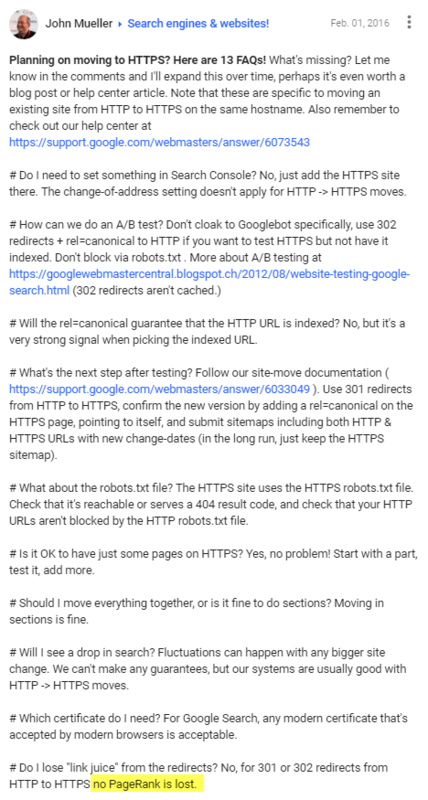 Our until then favorite Redirect extension Ayima Redirect Path simply didn’t show all the details, and also didn’t combine with the Canonicaled data, not to speak of other HTTP Header, alternate links or cookies for example. @davebuts I don't see a problem with that. If your users are also consuming your content like that, then go for it. Of course, your users can consume your content on PDF. Google can just show the user the PDF instead of the page. This is exactly the problem: what about the links going to the PDF? What about the rankings? You will lose your rankings against your own content! Yes. Google delivering the content on PDF is a problem. Not for Google. Not for the user. But for you! Again: You will lose your rankings against your own content! Or just check out my slides about redirects here. As you can see, it always pays to doubt the information you are given. If we would believe everything those Google spokespeople like to tell us, we would indeed have a lot of PageRank, but that is not what we are after. This is why we will continue testing and looking for ways to push our rankings. And so should you. The Penguin 4.0 update is just one more reason to keep testing and question everything we know about links and redirects.